Minnesota's Landmark Hotel. The Saint Paul Hotel, built in 1910, is a member of Historic Hotels of America and is Saint Paul's premier hotel. Located just nine miles from the Minneapolis/Saint Paul International Airport and Mall of America. 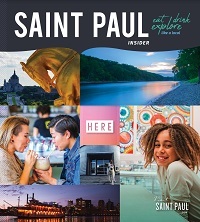 The Saint Paul Hotel combines turn-of-the century charm with every modern convenience. The world’s premier auto rally makes a stop in Saint Paul on Sept. 6. Here’s what you need to know before this breathtaking motor brigade comes through the Capital City.